Johnny Manziel is on the hunt for a new job after being released by the Montreal Alouettes of the Canadian Football League. In a release, the Alouettes say they severed ties with the quarterback, with the CFL's backing, after they "found that Manziel had contravened the agreement which made him eligible to play in the league." Moreover, the CFL is making sure that no one in the league can sign Manziel moving forward. With Manziel basically prohibited from playing in Canada, the natural follow-up question is whether he would try his luck with either the AAF or the XFL, which returns in 2020. Given Manziel's past problems with substance-abuse issues and short-lived, underwhelming career with the Cleveland Browns, a return to the NFL is such a long shot that only Lloyd Christmas likes the odds. But Manziel is "exploring new options." 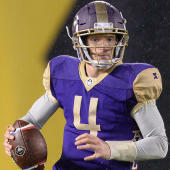 Regarding the AAF, there are a few things to consider. First are the technicalities. An Alliance spokesperson told CBS Sports that if Manziel was picked up by the AAF through the allocation formula set up by co-founder Bill Polian, he would be sent to the San Antonio Commanders. Manziel played college football at Texas A&M, where he was a Heisman Trophy winner in 2012. Multiple players on the Commanders' roster came from A&M. However, why Manziel was not only released by the Alouettes, but effectively barred from the CFL, is a major detail in whether the AAF would be willing to pick up such a polarizing player at all. The CFL did not explicitly state why Manziel was being cut and the AAF is looking into it further. In the meantime, new Alliance chairman Tom Dundon told USA Today that the league has offered Manziel to come work out. Manziel to the AAF makes surface-level sense, as the AAF had reportedly reached out to big-name quarterbacks in the past who are currently out of the NFL: Colin Kaepernick and Tim Tebow. Kaepernick wanted $20 million or more, according to the Associated Press, which obviously wouldn't jibe with the typical three-year, non-guaranteed $250,000 contracts AAF players receive. Kaepernick recently reached a settlement in his collusion case against the NFL, anyway, so he's likely at least $20 million richer. Tebow, meanwhile, was more interested in pursuing his baseball career instead of joining the Orlando Apollos (who are plenty happy with Garrett Gilbert). Regardless, Kaepernick and Tebow would have been good for the visibility of the AAF. One could argue that Manziel, in his own right, would also be good for viewership, especially since 1) there aren't enough entertaining quarterbacks to go around for every team and 2) Manziel's mobility helps when offensive lines haven't come together. "Right now, it's a decision of the GMs, and they can decide what they want to do," Dundon told USA Today. "If talent-wise this is close, the negative of him is that there is drama with him and you are trying to win games and build a team. The positive is that he brings in fans and attention." Manziel would be a project, of course, but that is common for players in the AAF. He wouldn't necessarily have to join with the intentions of reaching the NFL again, either; that is certainly a theme among many of the AAF's players, but it isn't an exclusive one. And since the contracts in the AAF are non-guaranteed, there's minimal risk incurred by the Commanders if they acquired Manziel. However, there's also the matter of whether Manziel would be a cultural fit for the AAF. The Alliance parades a no-diva, no-attitude problem type of league. Manziel's history suggests a lot of problems that don't mesh with those ideals. Whether Manziel joins the AAF, the XFL or neither is based on numerous factors in a fluid situation. He might find there's better exposure and/or money in the XFL. If he's hellbent on getting back to the NFL, the AAF has much stronger ties. But, as of the most recent news, there are no certainties the AAF would even take Manziel.